I am a Lover of all things Oakland. The people, places, history and especially community. 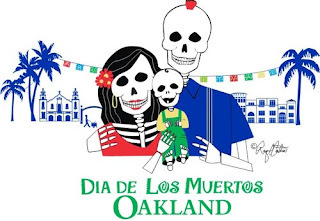 As an ambassador of the park stewardship program 10,000 Steps, I will be participating in the Oakland Museum community altar exhibit at the Fruitvale Dia de los Muertos Festival “Celebrating the Spirit of Community” this Sunday, November 1, 2009. There will be one large altar and 20+ community altars. For more information about the festival go here. Please stop by De La Fuente Plaza and International Blvd (location of altars)! This is the text for the altar I am coordinating. is dedicated to commemorate the people and places that have formed our community over the decades and generations. This altar is a map of the Old Oakland community with landmarks including Jefferson and Lafayette Square Park, La Borinqueña and images we pass on a daily basis. Every step taken is following the steps of those who came before us. This altar is a visual journal of our collective experiences. Gustavo Loza remembers the park during the 1960s being the place to hang out.” The recreation center used to be open 10am – 10pm and all you had to do was leave a valuable for a ball - a sweater, an ID, your wallet, anything of value - and they gave you a ball to play with, to play basketball or volleyball or tennis against the wall or a bat and glove. The rec center gave the park life. “It was not unusual for at least four different types of pick-up games to go on at any given time in this park. Old Saint Mary's School directly across the street used this park as an extended playground. The recreation center also provided home economics classes such as cooking and sewing to anyone. Historically, Jefferson Square Park is technically part of West Oakland. However, everything changed with freeway construction and other projects beginning in the 1960s. It is now part of a community referred to as Historic Old Oakland with borders that run from 6th to 14th Street and Broadway to Castro Street. Old Oakland was the original Downtown (1860s), the location of the first City Hall, and a thriving residential and commercial district for decades. The Jefferson Square Park Recreation Center, built in 1958, was the heart of this community until the late 1960s. Boone: “I started coming here in 1948 to play basketball and met people here, when they had people living around here! When they wanted to build the freeway and the police station, they knocked them people out.” In 2009, Boone is still here and has been looked up to as a role model by many in the neighborhood, whether it was cooking up fish sandwiches in the recreation center kitchen back in the day, teaching basketball tricks or replacing the basketball nets (sometimes out of his own pocket). Christina “Tina Tamale” Ramos: “Nati is my mother and growing up hearing her stories about the neighborhood and from those who played in this park made me long for a similar sense of community. In the late Sixties, the Evil City Planners began the demolition of fifty residential blocks in this neighborhood in order to build the Cypress freeway, Bart tracks and Acorn housing development. Our community was destroyed over the course of not so many years. During the Seventies, I remember playing there as a little girl, having picnics on the grassy field and going to art class that included snacks at the center. But then the children left or rather those of us still around, grew up. The park became obsolete, the young ones were gone. The area became a haven for "adults" including the homeless, drug dealers/users and other assorted characters in the Eighties and Nineties. Rosemary Escobar remembers visiting the rec center with the Latin American Library Bookmobile back in 1968. She found out that many Mexican ladies were taking English classes at a nearby church. Rosemary would translate simple children’s books from English to Spanish for adults to borrow. The ladies would ask her, “No me cobras?” “Aren’t you going to charge me?” and she would respond, “No, los prestamos” “No, we loan them.” They were amazed that they could take the books home and then return them to any library. Photographs of the park from this era were very hard to come by. Community members from those days mentioned repeatedly that cameras and film were expensive and generally reserved for special occasions. Fortunately, a few snapshots of people enjoying the park surfaced. We appreciate those who shared their stories and photographs with us. Some of these quotes came from participants of the Oakland Museum: The Latino History Project including Rosemary Escobar and Jose Arrendondo. Many of the young men and boys who spent a considerable part of their daily lives in this park during the 1940s and 1950s are no longer with us to share their memories, but they will not be forgotten. Eminent domain by the City of Oakland caused the destruction of the residential community (50 blocks) in West Oakland in the late 1960s and early 1970s. None of the concrete overpasses surrounding this park existed until 1972. This, in turn, was the beginning of the decline of many of the commercial areas of interest and of the Jefferson Park Recreation Center since much of the residential community was lost. The rec center programs dwindled and the center officially closed in mid- 1970s. The building is fenced off, abandoned since it’s seismically unsafe. There was the restoration of some of the old Victorian buildings saved in the late 1970s that remained empty for years. The 1980s and 1990s proved to be a difficult economic time for this area. The late 1990s saw a resurgence of residents in the form of nearby condominium developments. In 2006, a grassroots community group, Old Oakland Neighbors, was founded to unite residents, merchants, and other stakeholders who are committed to connecting, celebrating, and caring for Old Oakland. 10,000 Steps is a unique collaboration between marksearch (Sue Mark and Bruce Douglas), an independent artistic cultural research team, and the Friends of Oakland Parks and Recreation. In this ongoing stewardship project, the artists are working with neighbors and community groups that surround four historic parks in downtown Oakland – Jefferson, Lafayette, Lincoln and Madison Square Parks – to beautify and draw attention to green urban public space. Now in 2009, we have redevelopment on the horizon. A dog park will be replacing the rec center for Spring 2010 as a testament that the heart of a community can be reborn and appreciated by those living, working, and visiting in the neighborhood. This will be a park teeming with energy and vibrant with people of all ages enjoying the outdoors in the middle of an urban area. One day soon, Jefferson Square Park, will get its Happily Ever After.